As I've mentioned before, nowadays I am all in for Mochaccino. The hot and strong coffee with hints of chocolate is a truly ambrosial drink that you can enjoy at any time of the day. And anywhere I look, I come across recipes for cakes and desserts that infuse coffee and chocolate flavours together to get the absolute mocha delights. Hence, there is no surprise that I couldn't get past this Mochaccino Marbled Mud Cake (Source: Australian Women's Weekly Cakebaking) for my little one's 6th birthday; a rich and decadent marbled cake where you can explicitly taste the flavours of white chocolate, dark chocolate and strong coffee. 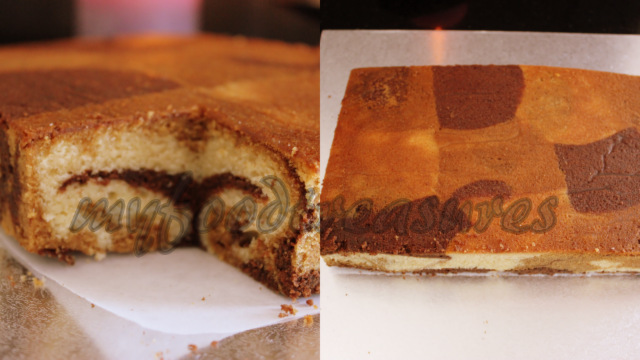 My boys relished the flavours and it has now become our most favourite marble cake. 1. Sift flours and cocoa powder and keep aside. Place broken chocolate pieces, chopped butter, sugar and water into a medium saucepan. Stir over low heat until smooth. Transfer mixture into a large a bowl, cool for 10 minutes and whisk in sifted flours, cocoa and egg. (You may not want to use the entire batch of dark chocolate batter. I used the excess batter to prepare 2 dark chocolate cupcakes). 1. Sift flours and keep aside. Place broken chocolate, chopped butter, sugar and milk into a medium saucepan. Stir over low heat until smooth. Transfer mixture into a large bowl, cool for 10 minutes and whisk in sifted flours and eggs. 2. Divide mixture into two equal portions. Dissolve coffee granules in boiling water. Stir this coffee into one half of the white chocolate batter. Stir in vanilla extract into the other half of white chocolate batter. 1. Preheat fan-forced oven to 140° C. Grease cake pan with butter; line base and side with baking paper, extending paper 5 cm above the edge. Keep the three cake batters (dark chocolate batter, white chocolate batter and coffee batter) at working distance. 2. Drop alternate tablespoonfuls of dark, white and coffee cake batter into the pan. Bake cake for 1 hr and 40 minutes (round cake) or 1 hr 10 minutes (rectangular cake) or until skewer inserted into the middle comes out clean. 3. Cool cake in pan before turning it out. Enjoy this cake plain or with white chocolate frosting or as I did made it into a Karate Ghi with sugar paste. wow..the cake looks irresitible & nice patterns..Belated bisthday wihes to ur l'il one,Hope he enjoyed the cake!! loved the cake and the design...I have worked with 2 batters, but never 3. This looks absolutely yummy. Love to do it sometime. My belated b'day wishes to your boy. Wow cake looks irresistible , wud luv to have a slice ..yum. 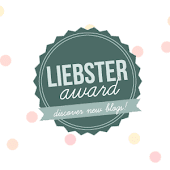 Happy to follow you , visit my place in ur free time and do follow if u like. Belated birthday wishes to your son! 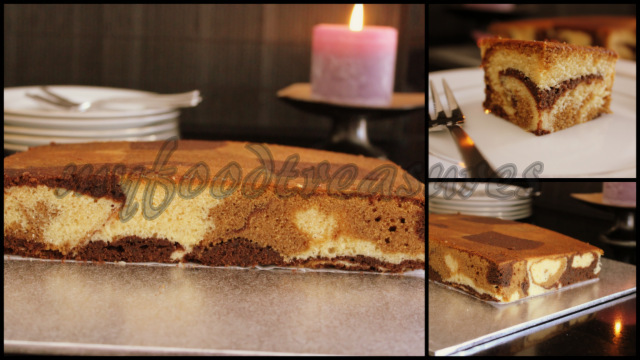 Beautiful & flavorful cake, lovely pattern. Belated B'day wishes to ur son, irrestible cake!!! Loved the marble pattern on the cake. Chocolate in Mocha flavored cake might have enhanced the taste of the cake I bet. Nice theme for the birthday cake!!! that looks good n well baked..